The ‘house full’ sign was up (with a waiting list of 50) for this conference at Ashridge Business School in Berkhamsted on 13 June 2016. Keynote speeches were provided by Lord David Owen, former Foreign Secretary and chairman of the Daedalus Trust, and John Neal, Director of the Ashridge Sports Business Programme. The body of the day was given over to 12 workshops run in parallel. “Ordinary levels of confidence and resilience are essential qualities for developing a successful career. However, an executive’s self-belief can be reinforced by their success to the point when they become unwilling or unable to hear contrary views, and sometimes even to acknowledge facts which might disconfirm their self-belief and self-image. This is the point at which they become a liability to themselves and their organisations. “How do coaches work effectively with such clients? How do they contract with clients who truly see ‘no issues’ when they have been referred to us and others clearly tell a different story? “Coaches run the risk of alienating clients if they confront them, but if they do not do so, they do not provide what they need most. And of course coaches’ own tendency to hubris is stroked by the very fact that such leaders choose to work with us, so we may collude and enjoy being in their ‘circle of trust’ rather than be the one who risks the rupture of a somewhat gilded relationship. David Owen commented that Hubris is not a medical disorder but a syndrome, evoked by, and configured around power – the ‘intoxication of power’ (Bertrand Russell). Organisational or collective hubris seems possible (cf. Richard Pascale’s book, ‘Managing on the Edge’ 1991) in which he talks about the seeds of failure being sown in an organisation’s very success (delusional belief in the ‘business model’, and failure to notice or hear any disconfirming evidence). As a side note, David Owen touched on the difficulty the Daedalus Trust is having in raising funds – a reflection of the reality that many of the leaders being approached may themselves be exhibiting hubristic symptoms. John Neal discussed his most recent research into the character of winners in sport. John talked about how the application of ‘intelligent hubris’ needs to be coached and developed and applied in the competition phase of sports performance. John will also explained how a failure to apply ‘intelligent hubris’ outside the completion phase leads to burnout and often failure. Drawing on his experience of working with athletes and sportspeople, John Neal also talked about the ‘tipping point’ from necessary confidence to ‘delusional self belief”. Vulnerability as an antidote to hubris. Erik de Haan and AMEC Alumni. What would we see if we looked at the world through the lens of a narcissist? Led by Dr Gorkan Ahmetoglu. This session set out to explore the mind of the narcissist and what part of hubris coaches should and can target in their interventions, and how. We confuse presence of good traits with lack of bad traits. For example, because hubristic people are often highly ambitious and courageous, we let them lead. At the same time however we forget that good traits do not take away bad ones. For example, ambition may be fuelled by a need to self-promote that drives a leader into taking any measures to succeed (including working employees too hard) which can lead to short-term success but cheating and derailment in the long term. Leaders who are very ambitious and courageous but not hubristic act very differently to those who are hubristic. The important thing is to build the confidence necessary in a leader, but to help them find a balance between using their ambitions and fuelling them further. A lot of success in the process is down to the interaction between coach and coachee. The silencing effects of power. Led by Megan Reitz and John Higgins. “Our impression of our own status and that of the other affects how we speak up, how we silence ourselves and how we silence others. “Labels such as ‘coach’, ‘CEO’, ‘administrator’, ‘young’, ‘woman’ that we apply to ourselves and to others convey subjective meaning in relation to power which adds to the complexity of the ‘space between’ coach and coachee. This workshop shared some of the findings from its leaders’ year-long study into ‘speaking truth to power’ with the aim of raising attendees awareness of the complexities of the dialogue in which coaches and their clients engage in and offers some suggestions as to how to speak openly with awareness. The emergence of ‘whistle blowers’. The phenomenon of ‘whistleblowing’ was mentioned. However, the group preferred to frame it as ‘if whistleblowing is the answer, ask a better question’… as whistleblowing puts all the onus on the individual to embrace the risk of challenging the might of the status quo. The need for whistleblowing points towards a culture that is resistant to hearing a version of the truth that does not fit with the accepted truth created, and maintained, by those who are seen as having power. Fixing nature – the ecological hubris of ‘wise wise men’. Led by Dr Alexandra Stubbings. Dr Stubbings’ programme notes commented that “we might be forgiven in the 21st Century for believing we are above nature; for celebrating scientific advancements that improve human well-being and guard against capricious nature. But in so doing we easily forget our dependency on sensitive ecological systems and are driving those systems to collapse. The role of a consultant, coach or facilitator in introducing the topic of ‘blind spots’ in our relationship with nature and our natural environment – is it appropriate to introduce the subject at all if it is outside the client’s consciousness and if so, when and how should the topic be introduced? There was broad agreement that there should be an opening for the dialogue initially in order to contextualise the topic (eg. a discussion of supply chain engagement and resource consumption or more personally, environments that support development of mindfulness). However the group felt that perhaps more important was introducing ourselves as coaches and consultants with a particular ontology and/or value set that informs our own ways of thinking and seeing; that, like all coaches and consultants, we are not ‘values-neutral’ however much we might wish to pretend we are, and that it behoves us ethically to be explicit about our own values orientations (eg. “when you hire me you will get ‘green pinstripes’; someone who will encourage you to bring into awareness aspects of yourself as an embodied being, participating in and dependent on nature and natural ecosystems; without any intention of shaming you or influencing you on a green agenda, but because in our society it is not our habit to pay attention to these things and as a coach /consultant it is my job to help you notice what you currently pass over and consider the implications of that”). Ways in which to sensitively introduce the subject in a group as well as in a one-to-one environment, starting with where the client is. Participants shared their own experience of doing so, often by using a more mainstream subject area that the client can engage with (eg. resource or energy consumption in organisations) before moving to more personal discussions and perhaps even provoking personal epiphanies through deep exploration of individual relationships to family, society, non-human others and the world around. We noted that ecological ‘hubris’ is so far outside of the psyche and philosophy in Western society, it manifests more as collective denial rather than hubris in the traditional sense of the term. So whereas with leaders, eg. Prime Ministers or CEOs, the hubris is very visible to others around them, with ecological hubris the hubristic beliefs, attitudes, language and behaviour are seen by a far smaller population who are often considered to hold marginal ideological views rather than be ‘bearers of truth’ to the masses. Such ecological hubris extends not only to ecosystem services such as quality of air, water, soil, food supply, but also other species, whether within the food supply or with whom the environment is shared. A more reasonable post-Enlightenment, post-post-modern view then would take into account the recent tendency, visible amongst the coaching and consulting communities even, to dismiss or overlook the physical aspects of our nature (beyond focus on personal well-being and the physical systems in which we are radically interdependent), and seek to overturn it, promoting far greater conscious awareness of ourselves as embedded in and part of nature. ‘Healing the split’ would start with recognising the existence of the split and using mindfulness techniques and ‘getting out of the classroom into the real world’ to explore our relationship to ourselves and our environment. Use of linguistic markers in the identification of chief executives’ Hubris. Led by Vita Akstinaite. Statements leaders make in public speeches, interviews, press releases, letters to shareholders, reports or in other documents or settings are reflections of their personality change and cognition. This session explored if and how hubris’ symptoms manifests in leader’s language use. It offered a series of propositions about hubris, natural language use and personality, and explored how signs of hubris can be identified in one’s natural language in order to militate against the failure of business organisations accruing from undiagnosed and unbridled executive hubris. Such methods as linguistic behaviours, use of existing Hubris Syndrome symptomology and machine learning were explored in detail. “What things can you notice? How can you ‘feel’ that shift in someone’s language? What makes you think that ‘something is not right’ here? What are the elements of their verbal communication that stand out?” These questions among many other were explored and discussed in the session. In most cases, however, these markers are less apparent (especially, as David Owen noted in his remarks, now that leaders’ advisors are aware of the issue). The key take-away from the workshop was that in certain circumstances language can work as a ‘DNA’ sample or a ‘fingerprint’. It is sufficiently unique to signify one’s own identity – and we can apply this knowledge to various fields, including hubristic language. Shame: The feeling that dare not speak its name. Led by Simon Cavicchia. Simon offered a series of propositions about the nature of shame, its relationship to narcissism, its implication in hubris, and explored particular practitioner orientations and strategies for working with these dynamics. He made particular reference to vulnerability and mindful absorption as antidotes to shame. Seeing the person behind the hubris (John Leary Joyce). Participants spent time experientially studying the nature of hubris and shame looking at the sensations, emotions, thoughts, body postures and movement tendencies that tend to characterise the experience. This was to enable participants to spot when shame and hubris are present and also introduce a way of working holistically in the context of a coaching relationship with the experience. Organisational hubris and individuals. Led by Matt Nixon. “Hubris is a disease of power, and that power is almost invariably gained from the context of organisations.” This session looked at how leadership hubris may mirror organisational hubris, and how both grow and suffer crisis and nemesis together. “There was a lot of interest in the conditions that might cause hubris, including the organisational context and leadership behaviours. Our group of around 25 included people from multiple industries, including Google, Lufthansa and the Foreign Office, as well as independent coaches and consultants. Leadership role accelerators, the characteristics of jobs that may increase pressures on senior leaders. Collusion in the Coaching Relationship. Led by Charlotte Sills and Bill Critchley. Charlotte and Bill explored the way the very hubristic client can invite coaches to feel flattered and inflated by their appreciation- even seduced by their context. This can lead to coaches forming a sort of collusive relationship, which gets in the way of effective coaching. They explored this notion from a perspective of transactional analysis and invited participants to think about how to manage the phenomenon. Their workshop was a mixture of didactic, discussion and experiential exercises. First, participants looked at the idea that Hubris in senior leaders is co-created with those around them. The people who work with and for powerful and successful leaders start to avoid disagreeing with or confronting ‘the great one’, so as they begin to start feeling invincible they are fed by the admiration of those around them – their feet leave the ground, so to speak. The session explored how the coach might become part of this – awed and perhaps flattered by the opportunity to coach such an august person, they become confluent and fall into being in an idealising relationship. The workshop leaders offered a model from transactional analysis (based in ego states) to explain this phenomenon of attaching to the apparently great, and invited participants to explore their own vulnerabilities in this area, their triggers and possible collusive attitudes. They proposed that the coach can and should be a valuable ‘toe-holder’ (Owen 2012) for the potentially hubristic leader and offered some suggestions for how to get out of the idolising trap – all of which involved having courage and staying true to oneself. Mirror and Mirroring at the top of organisations. Led by Yvonne Burger. This workshop explored what is happening in Executive (leadership) Coaching. 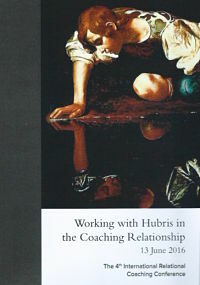 It contained a personal inquiry into coaches could recognise hubris in their coaching and how they relate to this subject. Yvonne also discussed some findings of her own research on this topic. Leading and living well under pressure. Led by Anthony Kasozi. This session looked at helping leaders overcome hubris, relational myopia and other challenges to their health. What therefore are the implications for what coaches do and how we work with clients? What has been our personal experience of leaders that live well? What pathways have they followed / are they following? What behavioural patterns and / or routines characterise the way they live and lead? What helps them along the way? What gets in the way? What are the effects / impacts they (and their teams / organisations) experience? What possible approaches / implications might this have for us as coaches (our approach and our practices / ourselves)? It became evident that ‘leading and living well under pressure’ is an important area for coaches. It is also not an easy topic to discuss in a large group amongst people from different backgrounds and perspectives and with different questions. Clearly this is an ongoing conversation. In particular it would be good to approach this more from an appreciative perspective and less from a critical problematic framing. Hubris an Affirmative Retroflection. Led by John Leary Joyce. “’I’m right till proved wrong’ is a powerful statement of self-belief, especially if the proof needed requires enormous effort by the other. “In Gestalt, retroflection is an interruption to contact where we avoid intimacy and vulnerability to the other by being self-referencing. This presents as enormous self-confidence which is envied by those who function in the polarity of self-deprecation. “Hubris as a positive and aware polarity that one can access and utilise as a strategy when necessary is a valuable resource. However when it becomes a vehicle for survival and a personality disorder it is a dangerous and destructive power. Taming hubris through the power of prudence. Led by Dr Alasdair Marshall. The objective of this interactive session was to discuss prospects for a particular risk culture solution, one that addresses problems of excessive risk-taking and seeks to tame managerial hubris. “This proposed solution will centre on harnessing ‘the power of prudence’. “Ethical reinvigoration of the term prudence, it will be argued, entails fostering a simple overriding concern with goodness and truth. Through this, self-governance of decision-making can improve, and managerial hubris – which Thomas Aquinas discussed as ‘false prudence’ – can be better controlled. Participants were expected to explore the power ‘prudence’ has to inspire a new bolder vision of risk culture, in particular by helping managers understand how goodness, truth and mindfulness all fit within an integrated framework to help recognise and avoid hubris. “The session began by focusing on the idea that hubris and reckless risk-taking are often very similar. More fully, it was suggested that hubris can provide a very useful frame for addressing reckless risk-taking and vice versa. “The main reason for establishing this link was to flag the idea that the widespread interest in reckless risk-taking post-financial crisis should pivot towards hubris to gain more psychological insight into the basic problems that need to be solved. “To find a common denominator for hubris and reckless risk-taking, we introduced the concept of the ‘dark triad’ – narcissism, Machiavellianism and psychopathy. “Not all participants were convinced by the ‘rise of the dark triad’ thesis which was presented at this point. However whether they viewed the dark triad as being on an inexorable rise within corporations, or whether as having always been there as an expression of ugliness and foolishness within human nature, participants seemed prepared to regard it is a useful frame. “A specific proposal floated was that within this framework, narcissism supplies a basic motivation for power and self-aggrandisement. Psychopathy and Machiavellianism supply remorselessness and interpersonal manipulativeness, allowing such activity to run in socially aversive directions. Furthermore, the emotional coolness of narcissists, enhanced by their dramaturgical skill, ensures dark triad individuals are good at concealing what they do. This pattern, then, was the basic ‘problem’ raised at the workshop. “The proposed solution was ‘prudence’. First, participants were asked what they thought prudence meant. Just cautiousness and de-risking? Well, doesn’t that mean Hannibal Lecter might be ‘prudent’ by carefully planning his next slaughter? This point was raised to call attention to the fact that the word prudence tends to be used today in a way that is ‘ethically faded’, which is to say characterised by an inability to see a need for ethical judgment. “If prudence is taken as a pre-worldly concern with truth and goodness which fills out ethical being, then it becomes powerful as a focus for wonder and reflection. To promote prudence might thus entail asking people to reflect on what truth and goodness mean to them, and in particular how much these things matter for ‘who they are’. One participant very kindly observed after the session that some companies might be absolutely terrified of this. They want to their employees to come to them as blank pages to be worked on. They certainly don’t want to encourage them to seek inspiration from the private ethical senses they hold in reserve, sometimes quite apart from their professional socialisation. “Yet to promote prudence in this way has potential benefits – for example it is where the courage necessary for whistleblowing can come from. Moreover, in the virtue ethics tradition it has been argued (eg. in Josef Pieper’s reading on Thomas Aquinas’ Summa Theologica) that this private, pre-worldly ethical sense is the foundation for justice, fortitude and temperance. And perhaps much more importantly, to promote prudence is to ask people to turn critical scrutiny inward and police one’s own conduct to guard against the slide into ‘false prudence’. “It was explained that in Pieper’s reading of Aquinas, false prudence arises from covetousness, which Pieper defines rather unconventionally as “an anxious senility, a desperate self-preservation, over-riding concern for confirmation and security”. “I argued that this wording deserves close attention. Immediately, it sets us thinking of how hubris and reckless risk-taking can be understood when considered through a narcissism lens. The narcissist’s fear of aging, linked to their fear of others gaining power over them, is certainly suggested by this wonderful sentence! “And so to the conclusion… prudence, considered as a protector against this false prudence, entails a form of mindfulness that turns inward and challenges narcissistic decay into narrow concern for the present moment, with a historical consciousness bearing what Erikson famously called ‘generativity’ in the late adult life stage conflict he envisioned between generativity and stagnation. In short, prudence needs to be understood as a concern for the future based on truth and goodness and extending into concern for the distant future. “An example was then given of such concern and the good it may have done in the world. The political psychologist David Winter offers a theory of ‘generative historical consciousness’. To illustrate the theory, he mentions how JFK, in the midst of the Cuban Missile Crisis, required his aides to read a book called ‘The Guns of August’ by Barbara Tuchman, which castigated Europe’s leaders for taking calamitous decisions without forethought. JFK didn’t want anyone making similar claims in a book called ‘The Missiles of Cuba’ in a hundred years time from the middle of a radioactive desert. Do we have this simple shift towards the standpoint of future generations to thank for the fact that we are all here today? Vulnerability as an antidote to hubris. Led by Erik de Haan and AMEC Alumni. This workshop was a celebration and launch of the second edition of the group’s book Behind Closed Doors: stories from the coaching room. 12 of 16 authors of the book together facilitated an interactive session on inquiry and vulnerability. The book Behind Closed Doors provides, through the words of the authors all of whom are practising coaches, a unique view into a coach’s highly personal practice, and offers transformational insights into the coach’s reflections and experiences, into the evolving relationships between coach and coachee, and into the effects and outcomes for clients. The book shows executive coaches how they can dramatically increase the value they bring to organisations and individuals alike, by creating more genuine client relationships. It shows how practising executive coaches can be more effective in building the relationship with their clients, in reviewing this relationship and in achieving more meaningful and significant coaching outcomes. The workshop started with a short introduction to the value of humble inquiry, an inquiry which includes individuals’ own sensitivities and their real, live vulnerabilities. We discussed how such an inquiry can be an antidote to personal hubris both in coaching and for coaches themselves, particularly if it is undertaken with an authentic, frank and at times challenging ‘tutor’. The process is based on the principle that the more coaches can allow this inquiry to touch on their own hubris as coaches, the more they enable themselves to be authentic, frank and at times challenging coaches to their clients. We discussed the way the ancient Greeks contrasted hubris (overstepping the mark, overbearing pride, defiance or presumption not justified by the circumstances or the perceptions of others) with sophrosyne (healthy mindedness, humility, restraint, self-control and tempering). After the introduction, participants were asked to undertake the process themselves. Workshop leader Erik de Haan asked them to write a challenging ‘question for inquiry’ on a piece of paper. The question was intended to be at the edge of their own hubris: areas where they might be overstretching themselves (a deeply-held desire, a sensitive area or conflict, an area where they may have been overstating their own power and impact). He gave a few personal examples. After gathering responses, five of the authors of the book spoke openly and movingly about their own inquiry question and inquiry journey. They elucidated why they chose the question, how it was meaningful to them, and how it related to their own ‘hubris’. They then spent some time outlining what happened when they inquired into their question, deeply and in a sustained way over time. The longest section of the workshop was taken up with inquiry into the participants’ responses. This took the form of very lively, two-way coaching conversations of just over 10 minutes each, with a 5-minute review. Every review was supported by an observer who was an author of the book Behind Closed Doors. At the end of the workshop we brought the process together in a plenary session and everyone received a copy of that book’s new second edition.